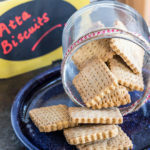 Easy, eggless and crispy Atta Biscuits are popular tea time cookies in India. Flavored with cardamom and nutmeg, these cookies taste best when dipped in chai! Chai time is probably the best time of the day for everyone in India. All our talks, meetings, discussions everything always revolves around chai. Everyone in India drinks at least 2 cups of chai everyday, one in the morning and the other in evening. And of course if anyone comes to your place, you have to serve them chai. It doesn’t matter if it’s 12 in noon of 11 at night, chai is must. It’s amazing how famous the Indian chai has become in the US and elsewhere. But I will be honest, our chai is not the like the one you get at Starbucks. But yeah when my parents are here and crave chai when we are out, we get them the chai at Starbucks and it seems to work. At least it has some spices and milk, so it’s not bad. Anyway our chai gatherings also involve lot of food. A typical evening in a north Indian household would be chai with samosa or pakoda (fritters) and of course some biscuits (cookies) and rusk. I cannot have my chai without my rusk or biscuit either. Yeah you can say I was raised that way and that’s what I saw everyone doing it so I got into a habit too. 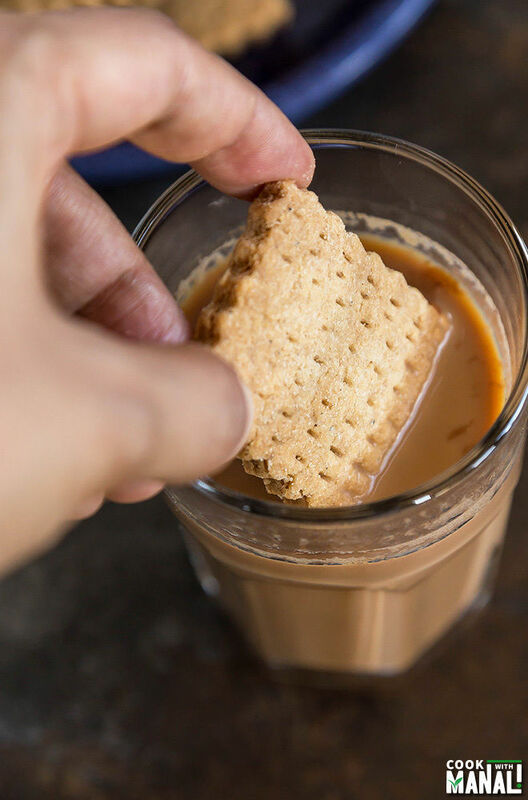 Here’s the thing, a lot of people dip the biscuit in the chai and it somehow tastes extra delicious that way. By the way, I am talking about crispy cookies here, we call them biscuits in India. My favorite chai time biscuits are often the ones which are super simple like these jeera biscuits, almond cookies or these atta biscuits. Atta = durum wheat flour, one which we use everyday to make our breads like roti and paratha. These cookies are one of my favorites and the best part about them is they are so easy to make. You need very few ingredients and no mixer to make these! There are no eggs and no baking powder and soda either. See I told you, super simple! Atta biscuits have been always been a favorite of mine. I remember I would always request mom to buy a packet of these cookies only for me. I never wanted to share them, well now I made them myself so that I can literally have the entire batch! I used ghee in this recipe, now you may use butter in place but if you can, please stick to the ghee. It just makes all the difference. 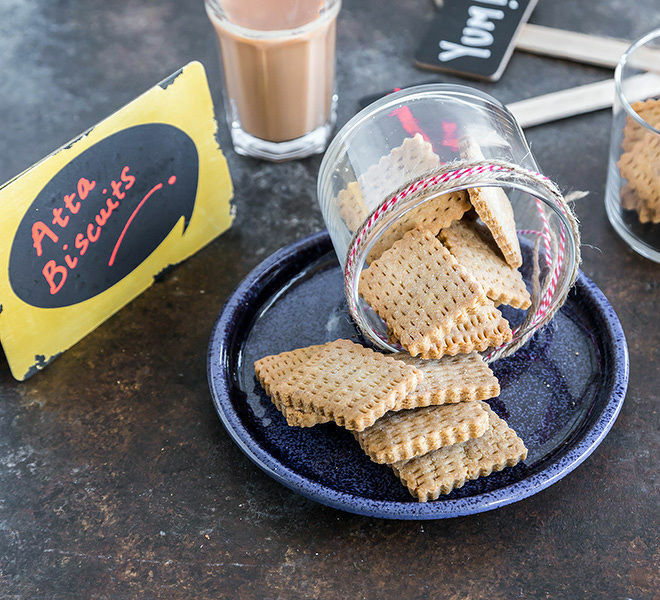 Hope you guys give these atta biscuits a try, it will definitely make you chai time more enjoyable. * Baking for 25 minutes will result in super crispy cookies. Bake for around 22 minutes if you don’t want too much crunch. 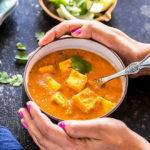 * You may use unsalted butter in place of ghee, but I highly recommend using the ghee. * I got around 30 small cookies, you may get more or less depending on the size of your cookie cutter. * I have used granulated white sugar here which is a lot finer that the sugar we get in India. If you are using regular cane sugar from India, just pulse it in a mixer to make it little fine. * The prep time includes the chilling time of 15 minutes. Crispy and eggless whole wheat cookies. 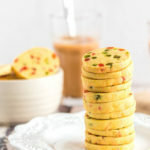 These Indian atta biscuits are flavored with cardamom and nutmeg and are usually enjoyed with chai! Add the dry ingredients into wet and mix. Add the atta in 2-3 parts and don't dump all in one go. I’ve never heard of these biscuits before, but I love how easy they are to prepare! Sounds perfect to go along with my morning cup of coffee! Don’t know about these biscuits, but they look so adorable and delicious. Love homemade biscuits and would love to try these! They look awesome! I’ve never dunked biscuits in chai before. Now I think I’m really missing out, especially since these sound lovely. I’m a big fan of chai, so I need to try these out! Oooh, they do look deliciously crispy! I bet they smell amazing when cooking, with the nutmeg. Oh yummy, Manali! 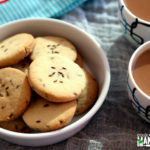 These cookies with chai sounds soooo good! I would love to try authentic chai someday soon with some of these delicious biscuits! They kind of sound like a shortbread cookie and remind me a little biscoff cookies! I eat those with my English tea all the time and it’s just the best combo! I can’t wait to make these!!! Dunked biscuit in chai is the best thing ever. And these atta biscuits look so nice and crisp Manali. Cinnamon and cardamom sound awesome here! Thanks Anu! absolutely, nothing like chai and biscuit! Tea is so much more soothing with biscuits! I’ve never had atta biscuits before, but there’s a first time for everything. They look beautiful, too! 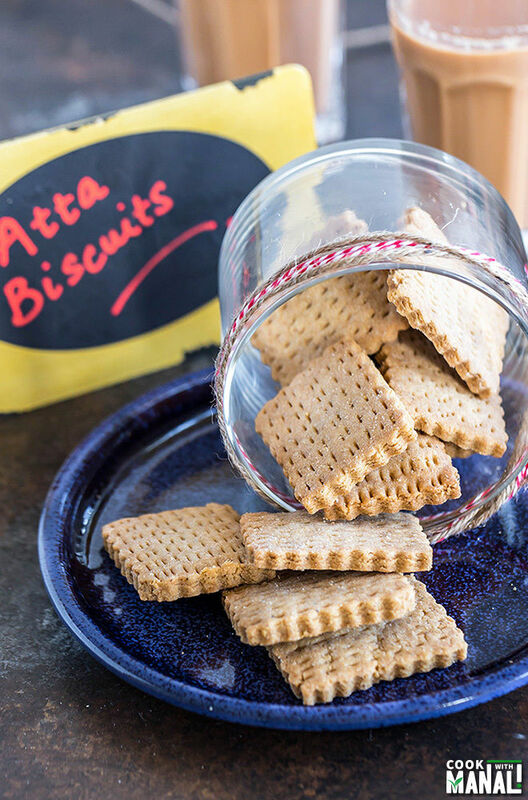 These atta biscuits are beautiful, Manali! They sound perfect with a cup of chai! They are so good with chai, thanks Kelly! You made me nostalgic! Will make these soon! 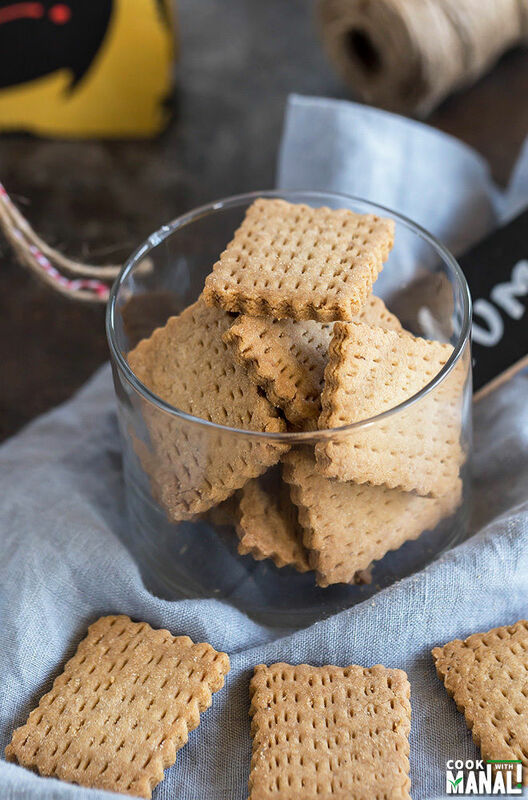 I must acknowledge your baking skills and thank you for this perfect recipe.i made these biscuits and every member of my family loved them.traditional,healthy,easy and delicious. Now I will certainly love to try all of your recipes.thanks and stay blessed. Thanks Hafsa 🙂 I am glad you liked the biscuits! These are perfect! 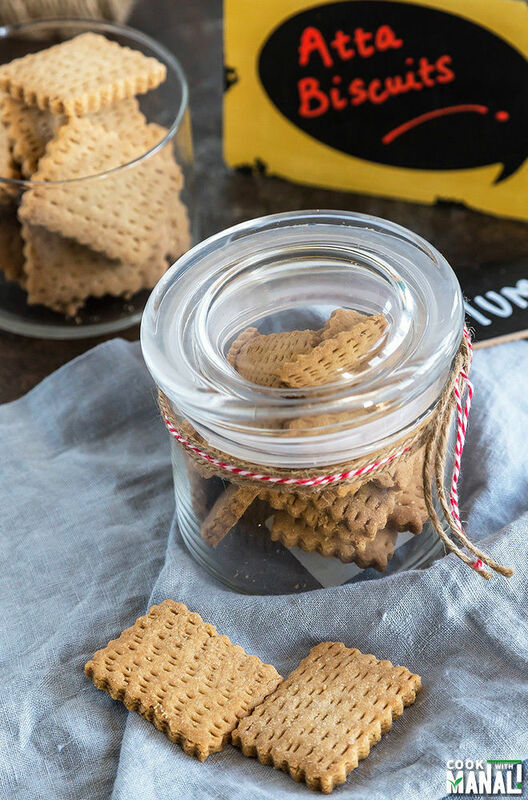 I used them as teething biscuits for my son and he loves them. They are perfectly crispy and healthy. They taste like the “nice time” chai biscuits we get here in India. Hi, the biscuits seem tasty and easy to make. But can we make them on microwave? If yes, then how? pls tell me know. I am sorry I don’t know how to make these in the microwave..this recipe needs an oven! Hi, can the substitute the ghee with olive oil ? 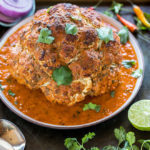 Hello , love this recipe , but have a question….. how many days can i store these biscuits if using ghee ? And how many days can i store these if i use butter ?? Hi Mini, They will easily last for couple of weeks in an airtight container when you use ghee…I have not tried them with butter but I think the shelf life will be lesser with butter.. I prepared dough but in tog on which setting should we bake it as it is first time for me to bake it in oven . Earlier I was using microwave with convection and grill plz help. I am using right now black and decker otg. Hello Laxmi, please use the baking mode..please read the manual of your OTG and use the mode that has been recommended to bake cakes and cookies. I am sorry I am not familiar with OTG so you will have to read the manual and figure it out yourself! Dont we need to use baking pwd or soda?? bake them for less time Manpreet ..also knead the dough until it comes together but don’t knead for too long! Made these cookies today. I used melted butter, cinnamon and vanilla extract. Got to use my animal cookie cutters, and these turned out amazing. Do you think it would be possible to reduce the sugar a tiny bit without affecting the texture of the biscuits? Hi Preeti! Glad you enjoyed these cookies! 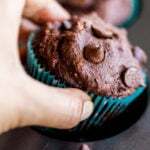 I think you can reduce the sugar, try and let me know! 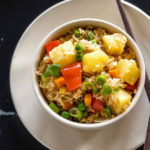 Can I add egg in this recipe? What other change will I have to make? Hi. Can these cookies be made in a microwave. I don’t have oven.